Do you love Street Fighter? I sure as hell do. 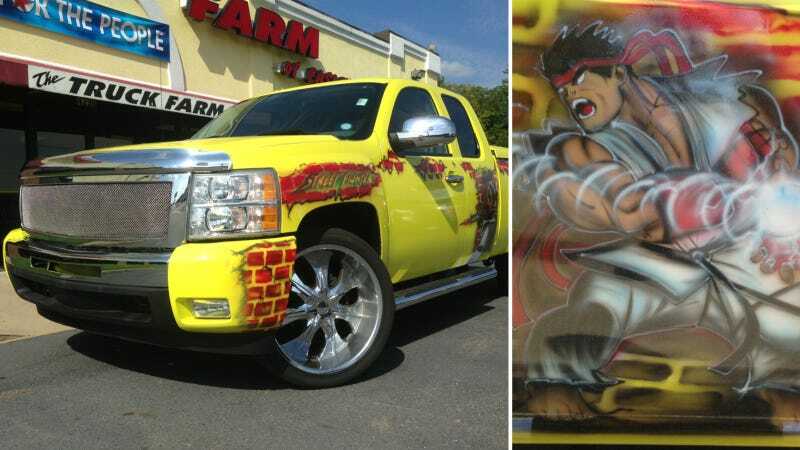 But odds are, no one is as deep into Street Fighter as this guy, who decked out his Chevrolet Silverado with airbrush art to show the whole world his passion for the fighting game — and The Bible. A Jalopnik reader who works for a car dealer in Easley, South Carolina sent us these photos of a stunningly awesome recent trade-in decked out a custom yellow paint job, chrome wheels, and full-color airbrush drawings of Ken, Akuma, Blanka, and Ryu. If that's somehow not enough for you, the former owner also airbrushed what appears to be a flaming and/or bloody blade attached to a Bible that is flying out of Ryu's hand on the driver's side. I could never get that move to work in the games. The truck also says "Fight the Good Fight of Faith" on the tailgate. With this kind of artwork, you might expect this bad boy is some ridiculous relic from 1992. Not so — our tipster tells us it's a 2011 model. I kind of want this truck. More importantly, I want to meet the awesome person who used to own it. I think it's an incredible celebration of Street Fighter, trucks, and being proud of what you believe in. I also can't wait to see who buys it. Any takers? Photo credit and hat tip to Mitsu!